Before 1934, Truman ran four times for various administrative judgeships in Jackson County, Missouri. In 1922, Truman won the Democratic Party Primary election and general election for Eastern Judge of Jackson County. 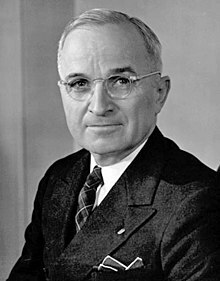 In 1924, Truman won the Democratic Party Primary election but lost the general election for Eastern Judge of Jackson County. In 1926, Truman won the Democratic Party Primary election and general election for Presiding Judge of Jackson County. In 1930, Truman won the Democratic Party Primary election and general election for Presiding Judge of Jackson County. ^ "MO US Senate - D Primary Race - August 07, 1934". Our Campaigns. Retrieved 2010-04-06. ^ "MO US Senate Race - November 06, 1934". Our Campaigns. Retrieved 2010-04-06. ^ "MO US Senate - D Primary Race - August 06, 1940". Our Campaigns. Retrieved 2010-04-06. ^ "MO US Senate Race - November 05, 1940". Our Campaigns. Retrieved 2010-04-06. ^ "US Vice President - D Convention Race - July 19, 1944". Our Campaigns. Retrieved 2010-04-06. ^ "US President - D Primaries Race - February 01, 1948". Our Campaigns. Retrieved 2010-04-06. ^ "US President - D Convention Race - July 12, 1948". Our Campaigns. Retrieved 2010-04-06. ^ "NH US President - D Primary Race - March 11, 1952". Our Campaigns. Retrieved 2010-04-06. ^ "US President - D Primaries Race - February 01, 1952". Our Campaigns. Retrieved 2010-04-06. ^ "US President - D Convention Race - July 21, 1952". Our Campaigns. Retrieved 2010-04-06. This page was last edited on 12 October 2018, at 14:51 (UTC).